I admire people who can completely embrace this way of eating. It’s too restrictive for me, but the evidence I’ve seen, both scientific and anectdotal, makes me think that it is, indeed, a better way to eat. I’m mostly vegetarian, but I occasionally eat fish and seafood, and I do eat dairy. However, more and more, I try to incorporate vegan principles into my diet. Unfortunately, the increased popularity of the vegan lifestyle presents an ethical dilemma for devoted cat guardians who believe that their cats should reflect their human beliefs about the treatment of animals and an environmentally sustainable lifestyle. Some pet food manufacturers, most recently Halo, a company co-owned by Ellen DeGeneres, are jumping on the vegan bandwagon and are offering vegan diets for pets. Halo has confirmed that they are developing a vegan diet for dogs only. To date, I’m not aware of any vegan feline diets on the market. Unfortunately, some vegan cat owners insist on preparing a homemade vegan diet for their cats. As omnivores, dogs are able to survive on plant materials alone, but even they are meat eaters by nature and do best with at least some meat in their diet, so even though dogs can survive on a vegan diet, it is not in their best interest. Cats are a different story. Cats are obligate carnivores who need meat to thrive and survive. Dietary protein supplies amino acids and is needed for the manufacture of antibodies, enzymes, hormones, and tissues. It provides energy and is essential for growth and development. Protein derived from meat and poultry contains ample amounts of these essential amino acids. While vegetable and grain based proteins provide amino acids, cats, unlike dogs, lack the enzyme required to process them metabolically. Another significant difference in nutritional requirements is cats’ need for taurine, which is important for proper functioning of the heart. Meat is a natural source of taurine; it is not available in plant tissues. Dogs can make their own taurine, but cats cannot. Commercial cat foods did not contain this important amino acid until 1987, when veterinarian Paul Pion identified the link between a lack of taurine in cats’ diets and feline dilated cardiomyopathy, a fatal heart disease that has been largely eliminated in the pet cat population since then. Proponents of vegan pet diets claim that there are ways to obtain these nutrients from plants, or synthetically. These claims are mostly based on studies done for humans, and don’t take the unique biology of cats into account. 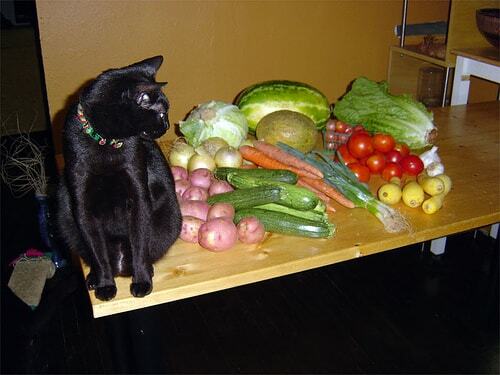 A vegan diet simply doesn’t make sense for cats. Why go against nature? A cat’s natural diet in the wild consists of mice and birds, both of which are almost all protein. The only vegetables cats eat in nature are the contents of their prey’s stomach. No matter what your reasons for being vegetarian or vegan, please don’t subject your cats to the same choice. Allow them to be the meat eaters nature designed them to be. As for meat-eating cats depleting the planet’s resources, I’ll worry about that when Allegra and Ruby start driving SUV’s. Marc – I suppose you have studies that prove that cats are as healthy on this Ami diet than on regular diet? Unless you so, you are engaging in animal experimentation on your own cat. As to loving the taste, I am sure they added a lot of artificial flavors to make it palatable. BTW – I really like all those pastries loaded with sugar and cream, I don’t think those eating only pastries would be a good idea for me, even if you add all the essential vitamins in artificial form. Ami Cat from Italy has proved very successful – cats love the taste of it!. A complete food enriched with vitamins and minerals, omega 3 and 6 oils and of course the essential ingredient for cat health – Taurine. Not tested on animals, and free from all animal based ingredients. Cats may love the taste, but in my opinion, this is not an appropriate diet for an obligate carnivore. If it’s not tested on animals (specifically in this case cats) how do they know it is a good diet for cats? It boggles my mind that PETA has vegan cat food! Politics shouldn’t enter into the diet conversation. We are talking about one diet for two very different species. Ingrid, please keep informing the public with your insights. Nothing PETA does surprises me anymore, Layla. What surprises me is that anyone would take PETA seriously enough to look to them for nutritional advice. Unfortunately, there is vegan cat food on the market. 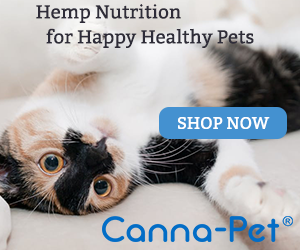 Even PETA is promoting vegan cat foods! PETA says “felines don’t need meat to thrive and should be fed an all vegetable diet”. SHAME on them. That doesn’t surprise me at all, Heather. PETA has credibilty issues in so many othere areas, I guess we’ll just have to add this one to the list as well. I recently went mostly vegetarian, but not for one second did I consider that my cats needed to eat that way! Rather the opposite, I’m trying to eliminate unneeded plant food from my cats’ diet. I mainly gave up eating meat because I don’t want to eat processed food, and that is what I consider factory-farmed animals to be. I will eat a little responsibly-raised and humanely slaughtered meat, but only rarely. Trish, I gave up meat more than fifteen years ago because I not only realized what’s in most factory farmed meat, but my eyes were also opened to what these animals go through. After a long period of completely eliminating red meat, I found that my body occasionally craves it. Once every couple of months or so, I will have some humanely raised and slaughtered beef. I try to source my cat’s food from companies that use meat and poultry from humanely raised animals as well. my cats are not vegan, however, the reason to continue to explore the possibilities of this option is to save other animals from unnecessary suffering. just as you would not want to see your cats killed to feed a zoo animal, we should be more mindful of ways to minimize or eliminate the killing of farm animals to feed our pets. Catherine, I don’t think it’s possible to go against nature when it comes to feeding obligate carnivores, but I’m all for exploring ways to reduce uneccessary suffering for farm animals. I think humane farming practices are a good start. Unfortunately there are several brands of vegan cat food. I even got into a debate with someone who blogged about feeding their cat a vegan diet, she didn’t believe that cats were still obligate carnivores – that by bringing them inside to live with us they no longer needed meat.. *shakes head* Since she refused to believe science, I gave up the hope of showing her the error in vegan diets. She truely believes that soy and bacteria created taurine is all her cat needs and believes the marketing of these companies – mostly because she wants to save the animals.. sadly though, it will be at the expense of her own beloved cat. Connie, thank you for your thoughtful reply. I do believe that it’s possible for humans to thrive on a vegan diet, but it probably requires a good understanding of nutritional principles in order to ensure that no nutrients are lacking. As for veganism as a practice, I think it is up to each individual to decide what they’re comfortable with ethically and emotionally. The piece you linked to presented an interesting perspective. I wholeheartedly agree that our current food system is not working, and it’s nice to see that more “mainstream” companies like Chipotle are sourcing their ingredients from sustainable, humanely raised animals. Despite the fact that Mewsette regularly shares my salad, Cookie liked corn on the cob and I’ve had a list of cats who begged for cantaloupe and related melons, I never presumed my cats could live on fruits and vegetables–that was even difficult for me. I take the time to look for sustainable and organic choices for myself, and do the same for my cats. There are and always have been many alternatives to factory-farmed meats for people and pets, and simply avoiding what’s commonly available doesn’t help the planet as much as supporting a free-range farm or even a company that purchases regularly from ethical and sustainable practices. Bernadette, I agree that it’s important to find alternatives to factory-farmed animals and animal products, and educate others about how to do so. I’m glad that the word’s getting out. An ardent vegan I know had a cat & didn’t think that cats truly needed meat & animal by-products & tried to get her cat to eat vegan. The poor beastie got really ill, as you can imagine, & she discovered what was wrong. The cat’s now thriving & the lady feels awful, although she’s glad the cat’s healthy again. She now knows & knows how abusive it is to force a cat – or any other animal – to go against their natures & to force them to be vegan, or even just vegetarian, if they must have meat in their diets. I’m glad that this cat recovered, Michelle. This is why education about this topic is so important.